The increase in the application of nanoengineering in diverse fields has contributed to the continuous search for biocompatible nanocarriers that facilitate the efficient and controlled delivery of bioactive substances. The growing interest of researchers in the use of surfactant vesicles for the delivery of bioactive substances is due to their high loading capacity and encapsulation capabilities. However, the stability and efficiency of the encapsulation of protein nanoparticles by surfactant vesicles are often affected by the intermolecular interactions between the protein and the phospholipid bilayer of the vesicle. Previous studies have demonstrated that polyelectrolytes form nano-complexes with proteins due to the electrostatic interactions between the proteins and the polyelectrolytes. Thus, this paper explicated the stability and efficiency of the adsorption of proteins on polyelectrolyte-modiﬁed charged vesicles compared to the adsorption of proteins on bare surfactant vesicles. Dr. Aristeidis Papagiannopoulos, from the Theoretical and Physical Chemistry Institute of the National Hellenic Research Foundation in Greece, demonstrated that cationic didodecyldimethylammonium bromide (DDAB) vesicles can be tuned to become suitable and versatile nanocarriers of bioactive substances by modification with the anionic polysaccharide sodium-hyaluronate (Na-HA). The work is published in the peer-reviewed journal, Colloids and Surfaces A. The author observed that an increase in the addition of sodium-hyaluronate resulted in an increase in the aggregation number and molecular weight of didodecyldimethylammonium bromide vesicles without significant impact on their hydrodynamic radius and radius of gyration (~160 nm). He also observed that the presence of a low concentration of sodium-hyaluronate changed the surface charge of the didodecyldimethylammonium bromide vesicles from positive (+70 mV) to neutral (-0.02) while the presence of a high concentration of Na-HA changed the surface charge of the DDAB vesicles from neutral to negative (−22 mV). Remarkably, his findings revealed that the adsorption of Bovine Serum Albumin (BSA) (negative net charge at neutral pH) on sodium-hyaluronate modified didodecyldimethylammonium bromide vesicles, with surface charge of the same sign with BSA, resulted in a significant increase in the apparent molecular weight of the complex by more than 3-folds. On the other hand the adsorption of BSA on bare DDAB vesicles, with opposite surface charge to BSA, did not have a significant effect on the molecular weight of the complex. His findings also showed that the adsorption of bovine serum albumin neutralized the surface charge of the bare didodecyldimethylammonium bromide vesicles while the adsorption of bovine serum albumin on sodium-hyaluronate modified didodecyldimethylammonium bromide vesicles increased the overall net negative potential of the complex. He observed that the complexation of BSA with bare didodecyldimethylammonium bromide vesicles and sodium-hyaluronate modified didodecyldimethylammonium bromide vesicles altered the secondary structure of the protein. He also observed that the conformational changes in the secondary structure of the protein were amplified by the presence of sodium-hyaluronate in the complex. Furthermore, the author observed that the presence of increasing concentrations of salt (NaCl) resulted in an increase in the apparent molecular weight of bovine serum albumin with bare didodecyldimethylammonium bromide vesicles and bovine serum albumin with sodium-hyaluronate modified didodecyldimethylammonium bromide vesicles. However, the presence of salt and the addition of bovine serum albumin did not alter the hydrodynamic and gyration radius of both complexes. 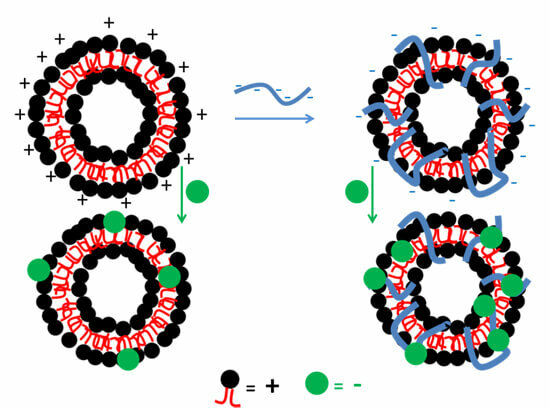 The study resulted in the development of a suitable method to enhance the stability and efficiency of surfactant vesicles for the delivery of bioactive substances. The intricate findings documented in Dr. Aristeidis Papagiannopoulos’ study provide an in-depth knowledge of how the molecular interactions between bovine serum albumin and sodium-hyaluronate modified didodecyldimethylammonium bromide vesicles contribute to the increased stability and efficiency of didodecyldimethylammonium bromide vesicles. Hence, his study serves as a basis for the use of natural polyelectrolytes and surfactant vesicles in the development of versatile templates for the delivery of bioactive substances. Aristeidis Papagiannopoulos is a postdoctoral research associate at the TPCI-NHRF. He has studied Physics at the University of Patras, Greece and owns a Masters Degree in Polymer Science and Technology from the same University. He obtained his PhD in Physics from the University of Leeds, United Kingdom in 2005 in the Polymers and Complex Fluids Group. He has worked as a postdoctoral researcher in several institutes and Universities as the University of Leeds, the University of Manchester and the Foundation of Research and Technology (Greece). He uses light scattering and small angle scattering methods to study complexation of stimuli responsive self-assembled block copolymers with proteins and associative biopolymers. His research interests cover development of microrheological, light scattering and interfacial instrumentation for the investigation of biomacromolecular systems in solution and at interfaces. He is active in the field of interfaces research with focus on adsorption of polyelectrolytes and proteins. He also investigates complex fluids from biopolymers with rheology and microrheology methods. He is the author of 36 research articles, and 8 invited chapters in books. Papagiannopoulos, A. Bovine serum albumin interactions with cationic surfactant vesicles decorated by a low-molar-mass polysaccharide Colloids and Surfaces A 537 (2018) 495–501.